Start packing the nylon and get ready to cast a line, we’ve stumbled across the best camping spots in NSW complete with uninterrupted views of good old fashioned Mother Nature. Now don’t expect wifi, room service or cute chocolates left on your pillows; but do expect early morning swims, no crowds, the sunrise from your tent, wildlife—and doing your business in a bush. No doubt you’ll be asking yourself “is this even real life?” when you cast your eyes on the epic scenery you’ll score from ditching the glam of hotels for the adventure and solitude of camping. Sydney, here are the best camping spots in NSW! Waking up on the beach is never a bad idea. Ever. Grab your tents and sleeping bags, The Farm, as the locals call it, is a coastal reserve and top surfing beach with stunning views in all directions so yes, this means you're in for some beach camping. Plus, if you’re up for a little adventure, there’s non-stop solid surf, and picnic areas giving you 360-degree views of Killalea, fishing and plenty of hikes to do. So if unzipping your tent and having front row seats to watching the sun rise over the ocean sounds like your kind of jam, you’ll definitely want to hit up Diamond Head. This incredible headland is home to 75 camping sites, picnic tables, BBQ facilities, showers and toilets (thank God). You’re guaranteed to make a few new friends (think kangaroos, wallabies and the occasional pod of dolphins), and get your Dora on hiking along the Mermaid Lookout track (yep, more stunning views). Best of all, this camping spot is pretty cheap too. Wake-up to the incredible surrounds of Bouddi National Park, which means the sounds of wildlife and a helluva lot of greenery. Just a short drive up to the Central Coast, The Putty Beach campground (located in the national park) is just a few steps away from the sandy shores and still feels like a bush camping spot. By the way, it’s a top spot to swim in rock pools, fish and walk. 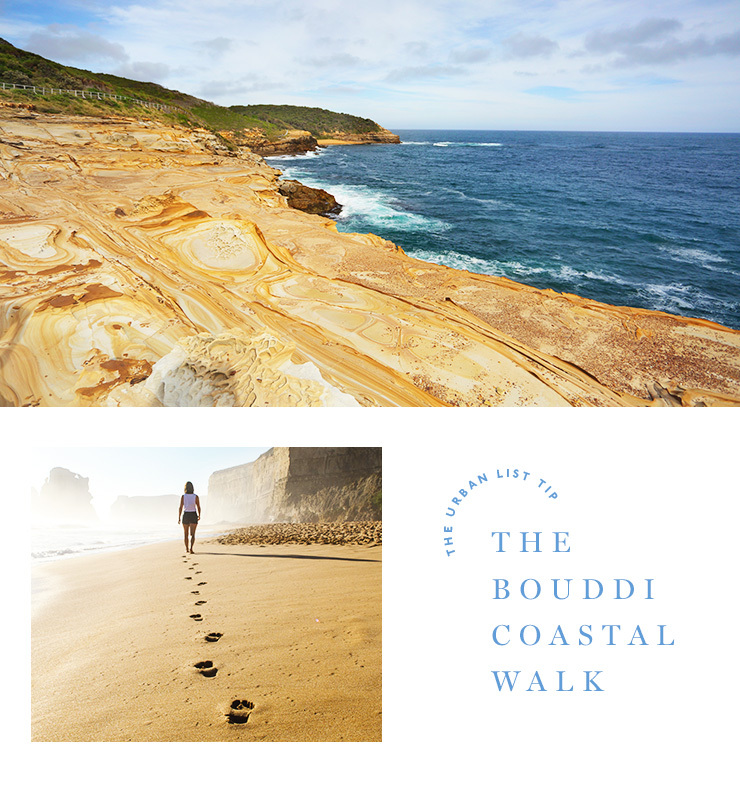 And we highly suggest you do the Bouddi coastal walk (yeah, it’s ten times better than the Bondi to Bronte one), which takes you all the way to Gerrin Point lookout. On the side, mobile coverage exists at this campground, meaning your Snapchats should go through most of the time. Just north of Bateman’s Bay, Durras is a campsite like no other with the main beach pretty much stretching as far as the eye can see. You could probably explore it for an entire weekend (read: explore it for an entire weekend). And because its shores and rocks stretch so far, you’ll be in for some insane sunset views and perfect conditions for kayaking… everyday. This is one of NSW's secret campgrounds so you’ll only ever share the beach with a handful of people and take it from us; bicycles are the way to go when it comes to making your way around. There’s also a large widescreen outdoor TV theatre to watch movies on, and they also offer a kangaroo guaruntee so if you see no kangas, you get your money back. We almost hope you don't see any so you score a free camping trip. Pitch a tent right near The Basin lagoon, famous for its refreshing waters, picture-perfect views and turquoise water. This is one of Sydney’s most popular beach camping spots and for damn good reason too. Fires are permitted (but only in designated wood BBQ or fire pits) which mean smores will definitely be happening. You can get to The Basin campground only by ferry from Palm Beach Wharf. We will never get sick of epic camping locations right on the beach. Yep, you guessed it; Coledale Beach gives happy campers like yourselves fantastic views of the waves and is sandwiched between rocks, which means you can set up camp without the Wollongong winds. Coledale is the ultimate spot to live on the beach for a few days, with a heap of water sports and activities to do, plus dolphins and whales make regular visits year round. And if you’re keen to bring your furry friends, Sharkey's Beach located to the south is an off-lead dog-friendly beach. If you’re after pristine, uninterrupted views that kind of look like you spent all your dosh and jetted off to the Maldives… this one’s for you. Honeymoon Bay campground is set in a picturesque location in Jervis Bay. Camping space is served up on a first-in-first-served basis and in peak summer, the campgrounds are allocated by ballot. 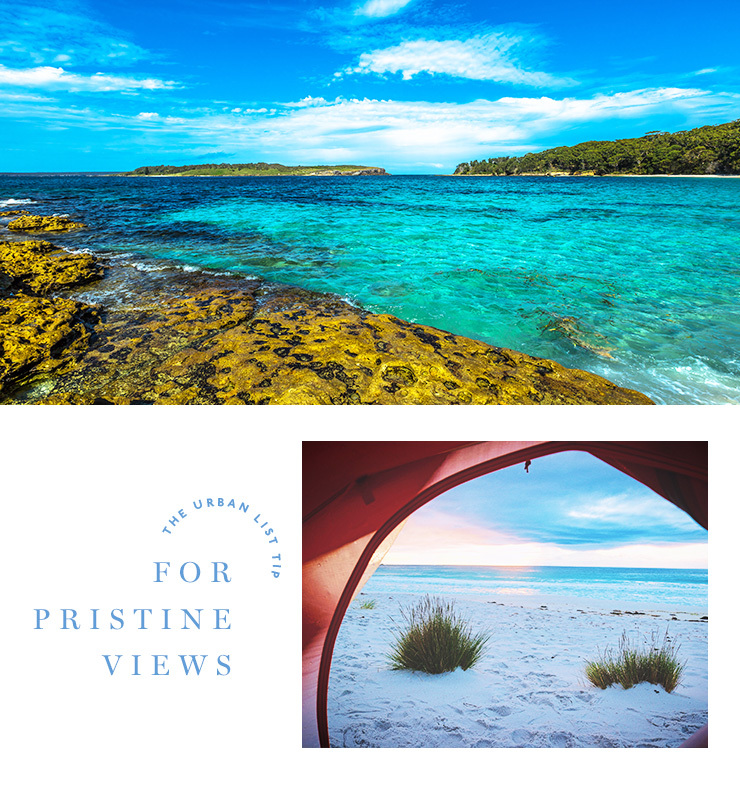 But it’s totally worth it to score some front-row seats to the white sands and clear water of this private enclosure by camping at this NSW gem. You get two for the price of one at Patonga. Cue a beach on one side and a creek to explore on the other. And there is no shortage of amenities with the Patonga campsite, which means access to electric BBQs (because there’s nothing worse than uncooked sausages), hot showers, a laundromat, tennis court hire and a nearby fish and chip shop (for when you burn the sausages). This secluded little bay lies at the mouth of the Hawkesbury River and has powered and unpowered sites up for grabs. So. Much. Wildlife. 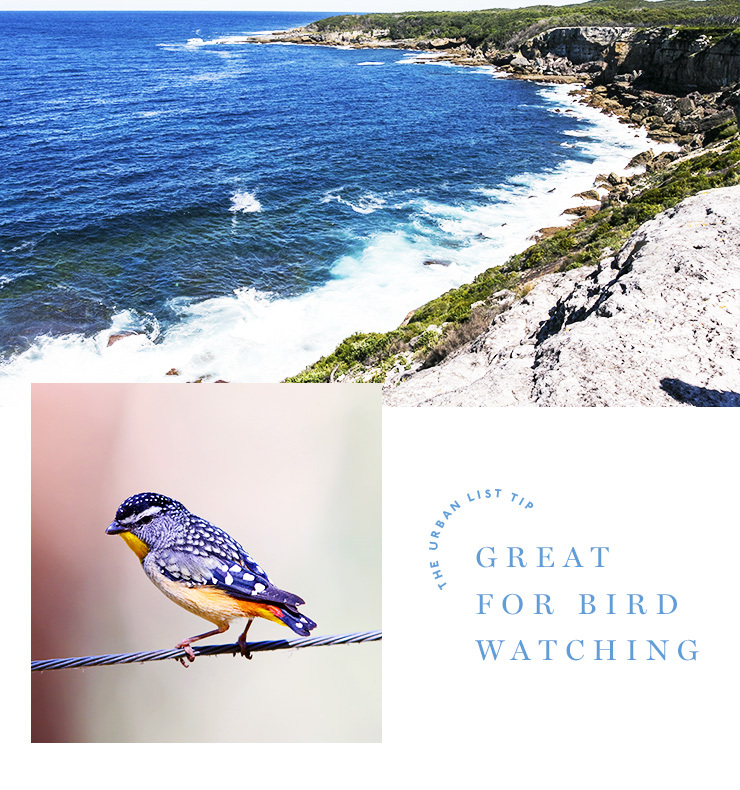 Booderee National Park is ideal for bird watching (should you ever want to see a Tawny Frogmouth or two), whale watching, fishing, hiking, kayaking, swimming and diving. There are various camping sites depending on your setup; Green Patch is ideal for families and small groups; the grassy area at Cave Beach is a popular spot for surfers; and if you like a campground with facilities (by that we mean you’re a fan of taps and such) Bristol Point caters for you and is suitable for large groups too. Boating or kayaking gives you easy access to some great little beaches past St Georges Head, as well as some stunning views of the sea cliffs as you pass Cape St George lighthouse. You’ll also want to spend some time at Murrays Beach to spot all of the marine life. If you’re after some camping with total privacy with a view to boot, Berrima Reserve brings you the whole package. With only four camping sites, you’re guaranteed a private getaway that is absolutely secluded but with all the goods (showers, picnic tables, BBQs etc.) of a major camping ground with creeks and bushwalks nearby to get your adventure on. Seriously, the views at this camping spot are akin to the greenery of a tropical island. We’re talking an endless vista of estuary and valley. And you’ll actually have to pitch a tent at this site because no caravans are allowed. Just north of Hornsby, this location is nestled at the base of gorges, leaving you with a heap of swimming spots and waterfalls to play with. It’s time to head west and rough it out (AKA bring your own everything) at the Jenolan State Forest camping ground. You’ll get to set yourself up in the middle of a pine plantation with walking tracks, bike riding tracks and serious 4x4 driving tracks close by too. There is also a heap of different campsites in remote bushland spots (you might need your 4WD), meaning you’ll have ultimate solitude when you’re out and about bushwalking, or taking a swim in a nearby waterhole. Shopping more your thing? Check this out.